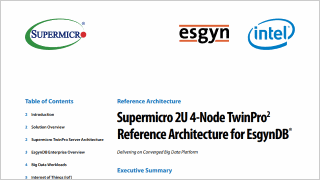 Supermicro Hadoop Solutions | Super Micro Computer, Inc. There is a tremendous amount of information driven by the ever changing applications, from structured, unstructured, to semi-structure data. Conventional IT infrastructure is not built to handle the variety, velocity and volume of the data produced by social media networks, mobile applications, machine sensors and scientific researches, etc. For Enterprises, utilizing big data analytics is no longer a question of when, it is a question of how. Hadoop, designed for the cost effective storage and processing of large volumes of data, is born for this purpose. It can linearly scale up to thousands of servers and petabytes of storage. How to take advantage of Hadoop technology and gain competitive edge is on the mind of almost every corporate CIO. For enterprises, how to deploy the Hadoop infrastructure efficiently means winning or losing in the big battle of market share. Enterprises deploying Hadoop solutions often spend large amount of resource searching for the best architecture and the most capable solution provider. This is where Supermicro comes in to help. Introducing Supermicro Hadoop clusters, a series of optimized big data solutions that provide high performance, high reliability and high scalability. Supermicro Hadoop solutions are fully integrated, fully optimized and completely tested turnkey clusters with flexible support packages available to meet customer specific requirements. Supermicro Hadoop clusters feature industry proven high density compute and storage servers populated with best of breed components selected through extensive engineering design, validation and testing. Certified configurations take the guess work out of designing and deploying a truly scalable Big Data compute and storage infrastructure that meets the most demanding enterprise IT and data center environments. Flexible network switch options with 1 or 2x 10G / 25G / 100G switches per rack. 24 Bay 3.5" 6 Bay 2.5" 8 Bay 3.5" 12 Bay 3.5"